I have not read the book, but right after watching Cloud Atlas’ trailer for the first time, I knew I was going to watch this movie. Not exposing myself to any other information about the movie, went and saw it on Day 1 with my brother and friends. It was an anachronic movie, where the time jumps were not mere Tarantino “This is what was happening at the same time at another place” style jumps. They were more of a “life-time” jump; showing the audience different lives at different times, connected to each other by the actions of past. To me, the movie felt like it borrowed a lot from my understanding of Indian culture and philosophy, things like Karma, Re-birth etc. I may not be an expert and might just have basic level of understanding of all these vast concepts, but I really felt like rambling on a little about what I saw as the Karmic Connection of the various lives involved in the movie (Spoilers ahead). Its more or less an interesting thought exercise, it might actually have been what the writer intended, or just some extreme scenarios made up by my thoughts. Right off the bat, it is clear that the movie is talking about things like “true-love” and trying it to prove it with a literal characterization of “partners across life-times” , much like the 100s of movies made in India talk about. As cheesy as it sounds, the movie shows all the very same concepts I am familiar with, in a very interesting & appealing manner. You see thousands of Bollywood movies talking about “जन्म जन्म के साथि” and there are even some which literally go as far as having stories where the lead characters are re-born and meet each other in another life time. 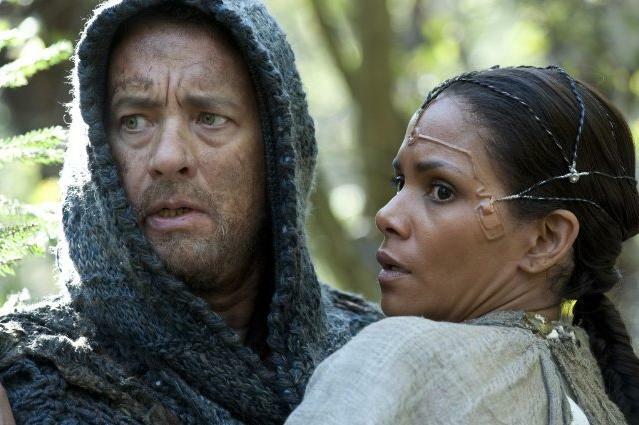 Similar to those, the lead actors in Cloud Atlas are seen being born in different lives, and finding their “true-love” in one of their many life-times. The same actor plays different characters in different lifetimes, this could be understood as the same soul, passing through lifetimes. Just like how each actor can be considered a soul; another cheesy concept shown in an interesting manner was how “fate” (the shooting star shaped birthmark) brought people together in different life-times. When the Old Man Sixsmith (his lover had the birth-mark) first meets Luisa Ray the reporter (Who has the same birthmark), it acts a point of connection for many previous lives to cross paths. Sixsmith is killed and Luisa meets Tom Hank’s character of the present life when searching Sixsmith’s office at the Nuclear Plant. 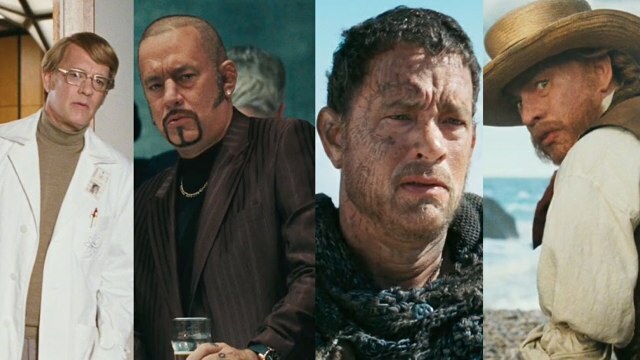 All these souls cross paths once again in their other lives throughout the movie. The unsuccessful love of Halley Barry and Tom Hanks in the 1970s is met with closure when Tom Hanks (who has the birthmark) meets Halley Barry in a distant future where they try and find the message left by Sonmi-451 (Doona Bae). Sonmi-451 (who has the birth-mark) finds “true-love” in Jim Sturgess’s character, both of them were “meant to be” because even in their previous life, they were husband and wife (Adam Ewing and wife). The actions and reactions that happen in each soul‘s lifetimes can be explained as it’s Karma and its eventualities. Why does the noticeably nice and well-natured Tom Hanks character that falls in love with Luisa Ray die in an aeroplane blast? “What did he do to deserve such a death?”? Well, you could explain it by sighting that in his previous life, he was that conniving doctor on that boat, he was so greedy so as to take another’s life just to satisfy his seemingly meaningless worldly pleasures of obtaining gold. Every character seems to have a negative/neutral/positive role in at least one of their life times, making neat connections to one another in the way their lives turn out to be. which means “Lead us from Untruth to Truth, from Darkness to Light, from Death to Immortality… “. Sonmi-451 seeing the light from the darkness. Interesting tidbit, a remix version of that Mantra is the end-credit music of the final Matrix movie. All these heavily played out Indian movie tropes, expressed in hundreds of movies, sang in thousands of songs, for some reason when expressed in such a re-imagined, beautiful, manner; gives a new outlook on how good movies can be. People like the Wachowski’s and Tom Tykwer with the passion to try something different should be commended for their efforts!